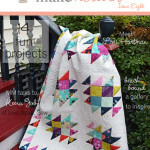 I’m excited to share my latest quilt design – the Lover’s Knot quilt pattern that is featured in Make Modern magazine, issue 11! 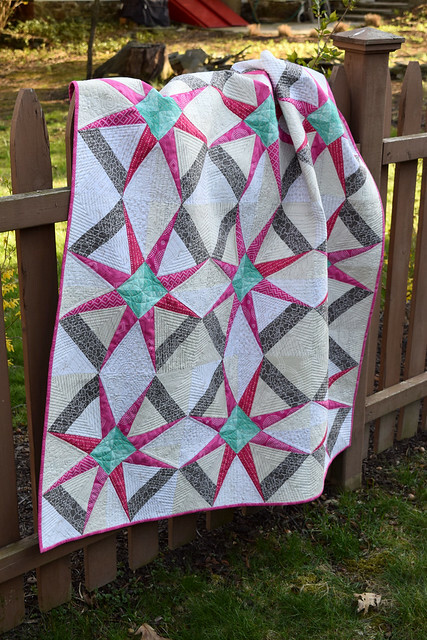 My work probably fits in the modern traditional style of quilting the best, and this latest quilt reflects that aesthetic. This is an old block- probably. 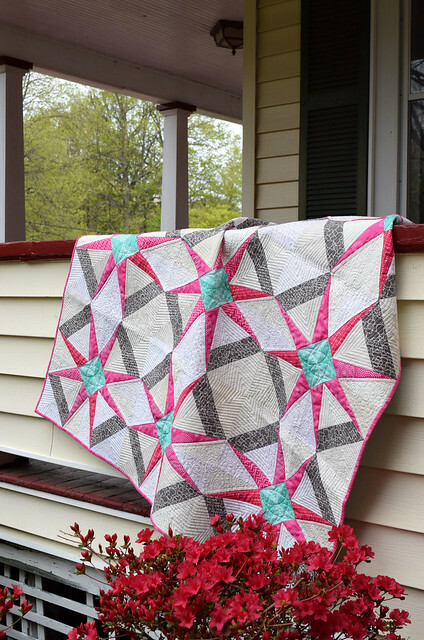 Barbara Brackman’s Encyclopedia of Pieced Quilt Patterns labels it as a “lover’s knot” from the Old Chelsea Station Needlecraft Service (OCS). This company began in 1933, but this block has no date and doesn’t really look like what most quilters would consider to be a lover’s knot. Even before this company started, this name has been assigned to a wedding ring-style quilt, a snowball/flowerish quilt block, and various other pieced blocks. 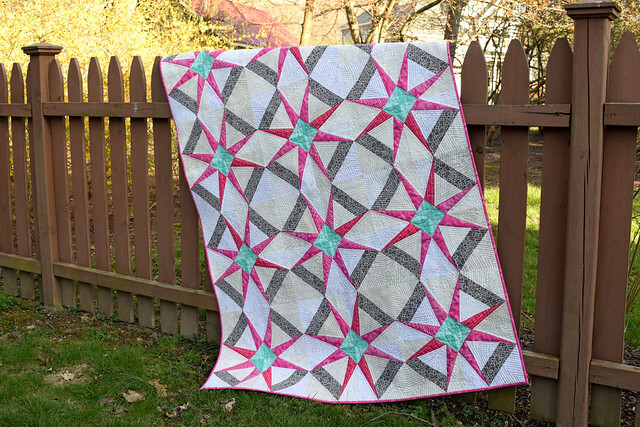 I had never seen this block made before, and I thought it would be a beautiful quilt, so I made the paper pieced pattern for it and made the quilt in bright spring colors against a low volume background. I really wanted the pink to stand out, so I stitched just inside of the pink spikes. The diamonds have swirls and pebbles, and the low volume starts have straight line quilting to echo the outside shape. I quilted some easy curves inside the turquoise centers. 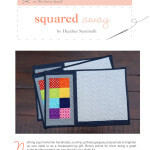 This quilt is 48″x64″, so it makes a nice lap quilt or can be made for a baby that you really, really like. I love the secondary patterns this design makes, and want to make a larger version in blues if I get some free time this summer. 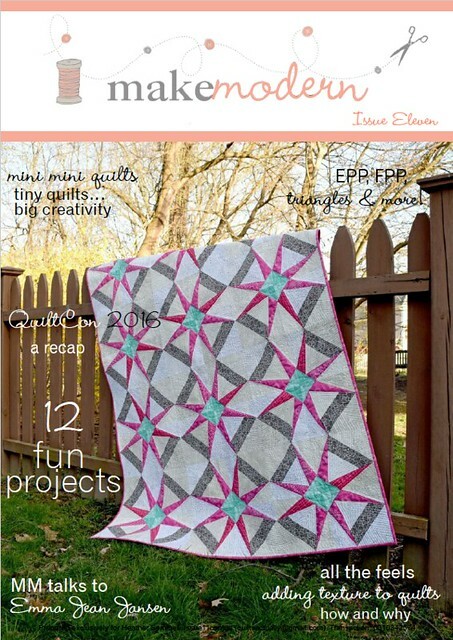 The pattern is in Issue 11 of Make Modern, which was just released on May 20, 2016. There are some other great patterns in this issue, as well as interesting articles. 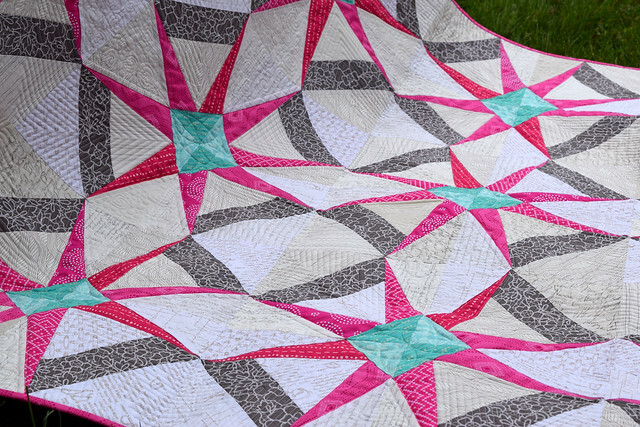 Stacey O’Malley of Slo Studio made an amazing quilt that uses hourglass blocks and inset circles. 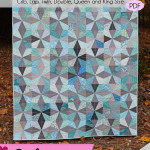 Alyce Blyth of Blossom Heart Quilts has an article on the math to do biased binding, and Sandi Hazlewood of the Crafty Planner recaps QuiltCon. 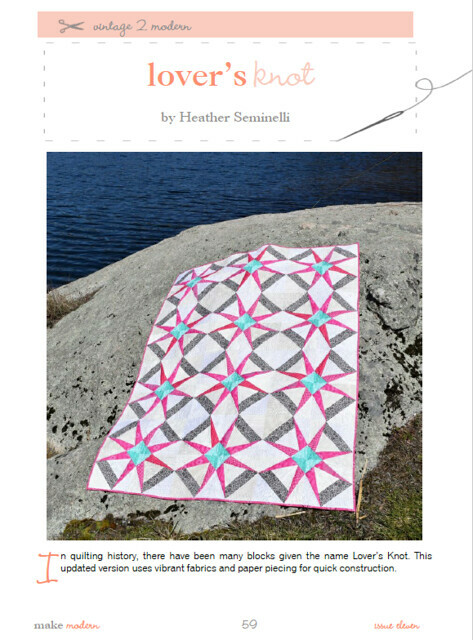 It was also fun to share the issue with Leanne (Devoted Quilter) – who was part of the Round Trip Quilts Bee I did last year (she made the X marks the spot mini with curved piecing and purple! ), and Anne (Hudson Valley Quilts) who wrote an article about online learning and is part of the Hudson Valley Modern Quilt Guild with me! Make Modern has offered a special discount code for contributors to share – enter issue11friends at checkout to get your copy of issue 11 for just $6 AU. I always love this magazine, and read my copy on the train on my iPad (which is nice, because then I don’t have to recycle it when I get to the city, like I do with most magazines). Congratulations! It’s a beautiful quilt. Looks so nice – wonderful colors! What a lovely pattern! And super pretty color choices. Most of my favorite patterns have that secondary pattern to them depending on what colors or prints you choose. I can see so many options in this quilt. This pattern is so very interesting and exactly something I would make. The secondary pattern adds a lot of interest. I love those bright pink spikes, and especially the low volume background. A blue/green version would be beautiful (can you tell those are my fav colors? 😉 Congratulations on a great pattern! Thanks so much for sharing on Main Crush Monday! Congratulations, Heather! 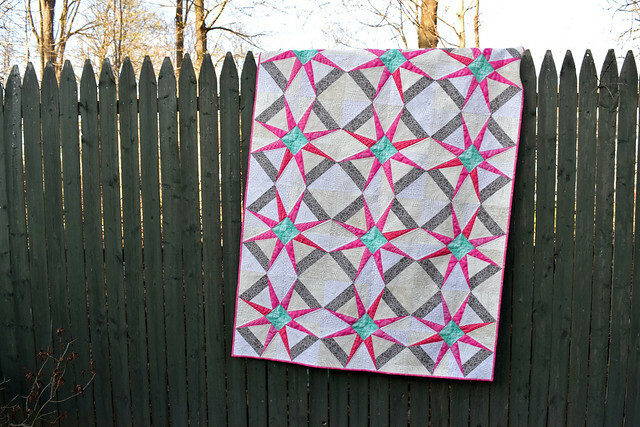 What A Striking Quilt!